In another life after college, Ian and I lived in Los Angeles for a few years. We had a great time there. We made a lot of memories, did a lot of exploring and had a lot of fun. We even held on to a little token from our time there, a house. After Ian and I had relocated to Scotland, my parents decided it was safe for them to move to LA and they did. The great thing about that is now we have a reason to visit and a free place to lay our heads...not to mention babysitting while we are visiting! The thing that I love about LA is that no longer how long you have lived there or how many times you have visited, there is always something new to see or explore. And Ian and I always love taking advantage of the free babysitting (not to mention the fact that everything is open late) and slip out after the kids are asleep to go exploring. 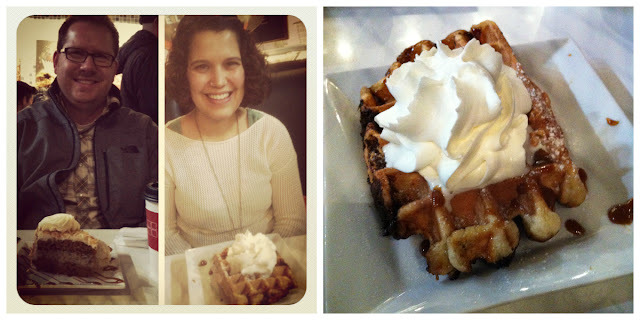 While we were in LA after Christmas, we visited Syrup Desserts in downtown LA. It sure was scrumptious. But it sure was crowded too. You have to fight for a seat. Like seriously flight. I risked my life for a table for us, but I got it. Ian had carrot cake. I had a waffle. It was delicious and just the right size. It was a great night cap. My mom and I went to the Melrose Trading Post. It's a flea market at Fairfax High School. It was full of all sorts of fun things. The prices though were too high for my taste...I'm a bargain hunter. But it sure did give my mom and I tons of ideas to try out. While on an adventure to the 99 Cents Store in Beverly Hills (yes, you read that correctly), we stumbles across the Urban Lights display at the LACMA. I recognized them from movies, but had no clue where they were. Apparently they are only a block away from the 99 Cents Store in Beverly Hills! In case you were wondering why we were at the 99 Cents Store in Beverly Hills, apparently it is the highest grossing one in the country and my parents wanted to go to it. Then we walked down to the Urban Lights display and enjoyed ourselves for a bit. The only way I can sum up standing in the middle of the lights is as magical. It was totally magical. If you are in LA, be sure to stop by there at night. Of course, I never turn my back on my favorites either. Almost every time I visit my parents, I make sure to make a trip to my favorite place, The Griddle Cafe. I found this place back when we lived here. If you visited me while we lived down there, or if you are ever down there with me, chances are I have drug you here. After all, the pancakes are bigger than my head and oh-so-scrumptious! If you decide to go, be prepared to wait. Especially on the weekends. The wait can be well over an hour long. But trust me, those amazing pancakes are worth the wait. Plus, they serve coffee via french press. And all the workers are always friendly. Aww, now I have myself missing LA. Soon enough I will be down there again, Well, not soon enough, but eventually. So fun! I love LA! So much stuff to do!